Oooooh heeeeey, three weeks later. Man. Time. What the? Some big things have happened in the past few weeks, namely that my injured toenail finally fell off. Also, my daughter (it is still so surreal to say that and have it be true) cut her first two teeth and is trying desperately to crawl. I have eaten entirely too many desserts (thanks, breastfeeding) and watched a whole lot of Real Housewives of Orange County (started from the beginning, and those squawking, sparkly, seagull ladies keep me company while I complete work for my four clients). Very, very big things, people. Very. Big. Things. And here’s a look at some of (all of) the things we’ve been eating! Salmon Caesar Salads – this was an out-of-left-field-but-still-oh-so-welcome suggestion from Davey the Hubbers. It was simple – salt and pepper seared salmon atop crisp lettuce, shredded parmesan, bacon and Trader Joe’s Caesar dressing. Spoiler alert: we’re having it again this week. Chicken Tikka Masala – always, always a favorite. Have I told you about how Jenna is no longer posting new recipes on her blog? Weep, weep, weep. Wild Rice Feta Salad – Y.U.M. Stuffed Peppers – I love this as a whatever-is-in-the-fridge dish. I love this base recipe and throw in any vegetables that may be less than fresh. I used beef this go round rather than turkey. 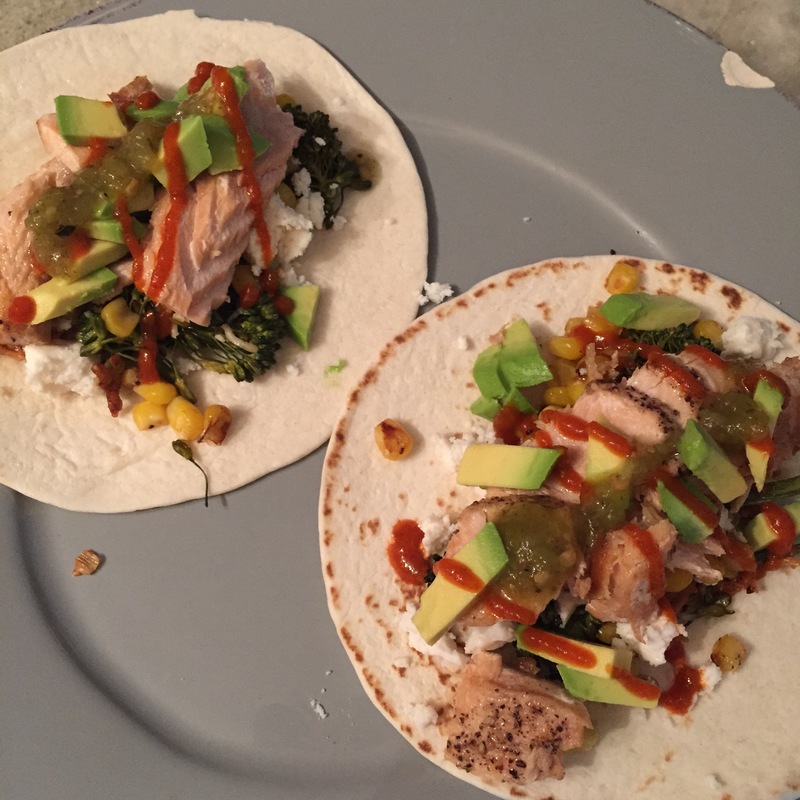 Salmon Tacos – Seared salmon, roasted broccolini, queso fresco, avocado, sriracha, salsa verde. Yes, yes and yes. Brown Sugar Lemon Chicken – This was my second time making this dish, and both times I’ve been surprised by how much I love it. It’s quite a lot. Beef + Mango Quesadillas – So few ingredients, yet such a big impact. This high-yield recipe lasted us for lunches all week. Beef + Blue Cheese Sliders – We LOVE these. So much that Davey asked, “can you not make as many this time?” “Why?” I inquired sweetly. “‘Cause I always eat too many, and I’ll eat ’em all again.” I made the same amount. This was the week of alllll new recipes. Eeeek! And for the most part it was successful. Southwestern Steak Wraps – This steak was DELICIOUS, y’all. DELICIOUS! I’ve been munching on it all week and sadly just finished it today with much wailing and gnashing of teeth. Italian Baked Chicken Pastina – Listen, Giada drives both of crazy, but I have to be honest that this dish was well-received. I doubt I’ll make it often, but it was easy, hearty and scrumptious. Smothered Chicken – This was a little too heavy for my taste, but I can’t deny that it was really tasty. Davey loved it. It isn’t as healthy as I prefer (CREAM! CHEESE! ), but I definitely didn’t turn my nose up at the plate. BBQ Chicken Cornbread Pie – What a different meal for us! I was leery, but pleased. I will say that the leftovers were better than the first night.